It is important to understand the impact on farmland values of wind and other renewable energy projects. 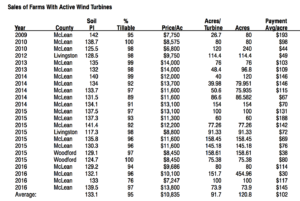 In this article, some empirical evidence is first provided from a sample of farmland sales with wind lease provisions and general comparisons to other sales made. Then, a set of important issues in evaluation wind lease payments is provided. Finally a simple stylized model is shown to help guide evaluation of wind lease payments that accompany a farm property. With 27 wind projects of over 50 megawatts currently online, Illinois is a leader in wind energy in the United States. Only five other states produce more wind energy than the 4,026 megawatts installed in Illinois. Mendota Hills Wind Farm in Paw Paw was the first utility-scale wind project in Illinois starting in 2003. Others quickly followed, including Twin Groves Wind Farm in McLean County in 2008 which was the largest wind farm east of the Mississippi River upon completion. Now 15 years since the early projects began, there is significant data to show added value to the farmland where the towers sit. 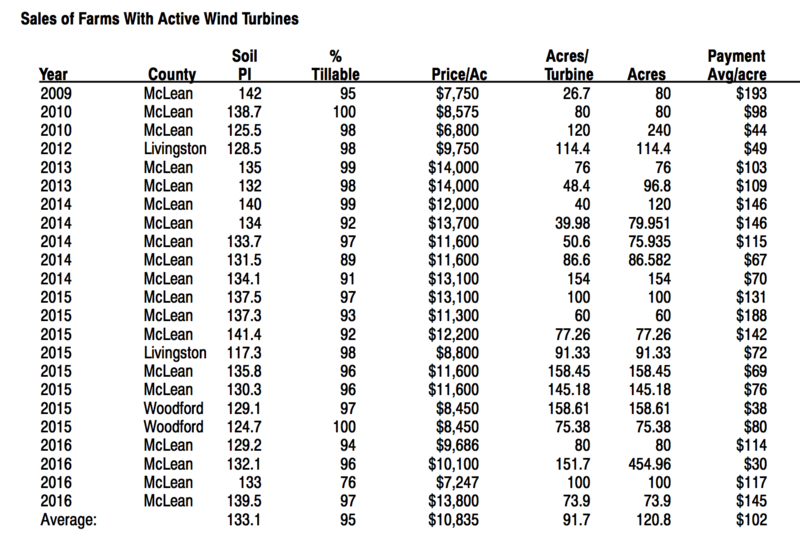 David Klein, Managing Broker of Soy Capital Ag Services, has been tracking data from three wind farms in Central Illinois’ McLean, Woodford and Livingston Counties over the past ten years. During 2009-2016, there were 22 sales of farmland in this area with wind lease income averaging $102 per acre across those sales. These were compared to general farmland sales to determine the impact on values, which shows an average $1,162 per acre increase on the farms containing wind power payments. The typical income capitalization rate, or CAP rate for short (investor expected rate of cash return) is between 2.5 to 3.5 percent for good quality, central Illinois farmland. The capitalization rate for the wind lease payments, based on the data above, was approximately 9 percent. This may represent a significant opportunity to increase overall farmland returns where wind energy payments exist, though there are many considerations in evaluating the total impact on values of energy lease payments. Operating around the towers can make farming more difficult, both for field level operations and for improvements including drainage structures and irrigation. Noise, vibration, and shadow flicker issues may be a concern, and there are not fully unified requirements for setback or accommodation of externalities from location to location. Land is generally viewed as permanent and non-depreciating, but the length of remaining payments and potential decommissioning issues have shorter durations than the underlying asset. Aerial crop protection can be severely affected when there are turbines on a farm. While spraying near wind turbines can still be completed, it is notable that turbulence created by turbines can change wind flow for up to two miles. Not all of the farming issues are necessarily negative. Turbine access lanes around the farm can be a benefit to the farmer and the landowner when placed in efficient locations. The access roads leading to the turbines can provide safe and convenient parking for semis and equipment used during planting and harvest, and in many projects, the gravel lanes also provide a payment back to the farm as well. It is important for township and county officials to require wind energy companies to improve public roads upon completion of each project. Consideration for road damages may also need to be included in the accrued decommissioning costs of the turbine removal process. The general landscape change often impacts other local residential residents. Concerns are often voiced over proximity to avian wildlife patterns and activities related to hunting and use of other natural amenities. Liability limitations and operations-based indemnity provisions, subrogation waivers and insurance protections are all legal matters that concern those within the legal profession working with landowners. Questions about residential values in areas of turbines occur, especially during periods of construction, and whether those neighbors should also be compensated. Generating equipment is becoming larger and more efficient. While these changes will lead to fewer turbines required to produce the same amount of electricity, it also increases single turbine landownership participation risk. With the increasing size of turbines questions have been raised as to the potential vibration, noise (decibel levels) and shadow flicker from longer blades. The industry continues to evaluate and attempt to address the issue with blade modification and other engineering improvements, as well as set-back requirements from non-participating residential neighbors and participating farmsteads. Some county boards are requiring larger set-backs than those required by the state, which increases the difficulty of development. The method by which the power purchase agreements (PPAs) are made and determined could impact which projects survive, and which projects end prematurely. Importantly, it may also be possible to include royalty or generation bonus payments based on the nature of the PPA so that in addition to a fixed payment for the land used, a payment based on the amount of generated power could be retained by the land owner. Decommissioning security is another area of concern for all wind (and solar) developments. The state of Illinois demands certain minimal requirements for decommissioning. However, the question often arises as to whether the time to decommission is too generous, whether economic levels are adequate, are they properly funded, and should the frequency for updating the values be increased. Concerns exist with what will happen to the turbines if and when the project ends and energy production ceases. Because there has not been a wind project decommissioned in Illinois at this point, it is difficult to guarantee that the decommissioning will be handled properly. County zoning officials may want to consider requiring increased frequency in the evaluation of decommissioning costs to new projects beyond those required by the state. The ability to separate wind lease payments could provide more insight into their value, but this is still an issue in its infancy with no clearly defined markets yet. Interpretation and valuation by the lending community is also critical in accurately accounting for and accommodating the value of lease payment contracts. As lenders become more comfortable and experienced with the payments from wind leases, the amount they are willing to lend should increase as well. Lenders’ comfort levels with wind leases should also increase as the industry matures and improves the understanding of income stream correlation to the farmland value. There are specialized firms that help bridge the gap between the legal and financial components to help landowners accurately and completely evaluate lease payments. Determining the value of a wind lease on farmland in a newer project with limited sales data is challenging. While data from prior, more established areas can be used to help determine the factors that matter to buyers and provide insight into possible values, current capitalization rates are changing, and the aging of guaranteed payments, along with decommissioning or risk funding payments, may differ. To help understand the implications, a simple tool was developed that combines the farmland lease or income with lease payments and the potential for a risk or decommissioning fund payment to identify basic starting positions, and also to allow sensitivity tests to be easily performed against any of the entries. In the case shown below, a farm is being evaluated with different cap rates applied to the farmland return series, the lease payment series and a sinking fund accumulation for end of lease risk. For concreteness, assume that the farm generates lease payments of $335/acre per year and has property tax obligations of $40/acre per year. The farm owner’s discount rate is 4 percent and the cash payments (income and taxes) are expected to increase at 1 percent per year. 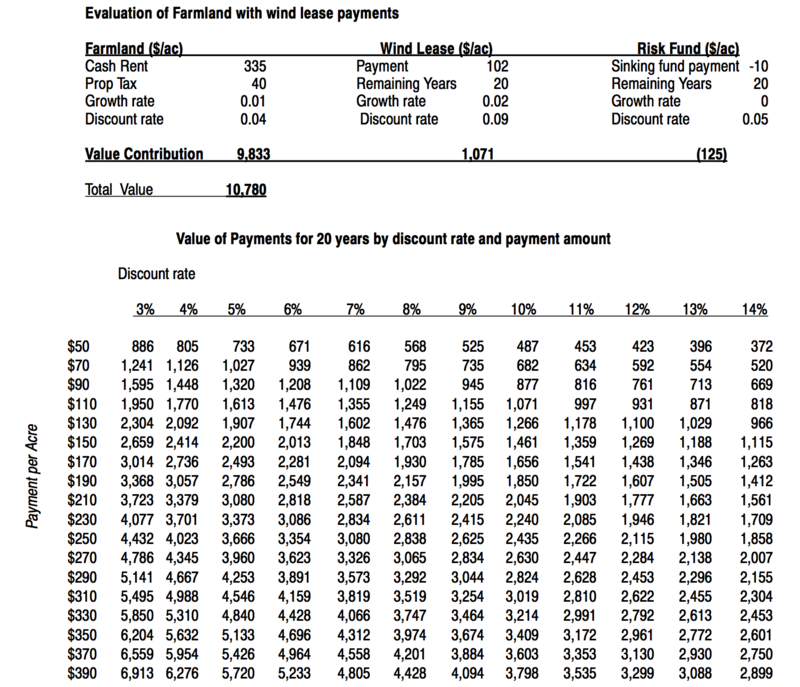 The wind lease payments are $102/acre per year and have a 20-year remaining life, with an escalation of 2 percent and a required discount rate of 9 percent. The owner also has a desire (or requirement) to include a set aside into a sinking fund for end of lease contingencies and is funding that at $10/acre for each of the remaining 20 years, in this case to correspond to the end of the lease payments. The discount rate applied to that stream is 5 percent. Each of these entries can be adjusted to determine the impact on each of the value contributions, and thereby the total as well. Given these starting values, the farm could be valued at $10,780 and be consistent with these initial conditions. A price higher than that would drive down the yield on the investment and a price lower would be consistent with higher capitalization rates for example. Following the table, a simple sensitivity matrix is provided that compares the values of capitalized payments across different levels of cash flow and discount rates. That table is also tied to the elements of the evaluation model and shows results for the life chosen for the remainder of the lease payments (in this case 20 years) If interested, the spreadsheet used to generate these tables can be downloaded here. 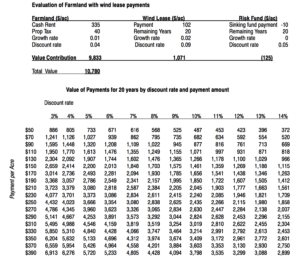 This analysis is very simplified and stylized for the most basic case, but still can be useful to understand how changes in payments, capitalization rates, and length of terms can affect the value of wind lease payments on a farm’s value. For more realistic valuations, a professional familiar with the specific terms and conditions should be consulted. As the market becomes more efficient in dealing with the lease payment analysis, the value to all farms may, in fact, increase. Answers to the unknown will also provide comfort in investing in land with wind and other alternative energy sources. Additional data, research and professionals in the farmland industry will help fill the knowledge gap to provide better answers in the future. Seth Baker, AFM is Owner and President of Field Level Agriculture, and can be contacted at, Field Level Agriculture, Inc., 505 Broadway, Suite A, P.O. Box 169, Mt. Zion, IL 62549, (217) 329-4048, seth@fieldlevelag. com. Dave Klein, AFM, ALC is Vice President of Soy Capital Ag Services and Managing Broker, and can be contacted at #6 Heartland Drive Suite A, Bloomington, IL 61704, 309-665-0961, www.soycapitalag.com. Brad Haight is the founder of LeaseGen, LLC. LeaseGen values wind and solar lease revenue streams for buyers and seller of property where turbines or solar equipment is installed. LeaseGen also helps owners structure the economic provisions of their wind and solar leases,with a focus on long-term value creation. He can be contacted at: brad@leasegen.com or by phone at 720-509-9011, www. leasegen.com.